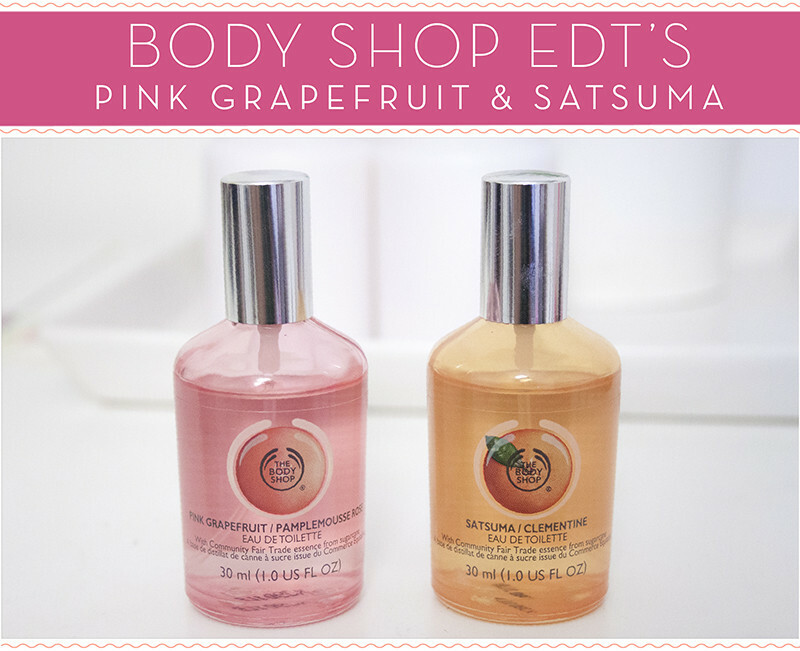 I don't think I've ever blogged about anything from the Body Shop since I started blogging so when I received these perfumes I was pleasantly surprised with them. I spent my youth wasting my money in the Body Shop on bath pearls, body butters and lip balms. But I don't think I couldn't tell you the last time I went into a store! Now I love my perfumes so I was intrested to give a go some of the newer scents from the Eau De Toilette range from the Body Shop. Satsuma Eau De Toilette is a zingy, fresh and energising perfume. While it is quite sharp, bordering on a tiny bit synthetic on it's opening notes, I really do like it. It's summery and invigorating. The dry down is fairly tart and sweet, with the synthetic orange scent disappearing once dry. I've had a fair few compliments on the Satsuma EDT while testing it and I think it's definitely going into my regular perfume rotations for the near future. I always think it's telling when someone notices the scent of your perfume and compliments you on it. I always forget how much I like the scent of Pink Grapefruit until I smell it again. Pink Grapefruit Eau De Toilette is light and wearable with a strong zesty pop. While also a very citrusy scent on opening notes, I found it to be not quite as strong smelling as the Satsuma EDT but is very pretty on dry down. to me Pink Grapefruit is a very hippy-freespirited kinda fragrance! Fresh and peppy, bright and stimulating of the senses. I always think Pink Grapefruit reminds me of a bath gel that my Mum used to always use so I find it quite a comforting scent. Lush Happy Hippy smell's quite similar to it actually. Although I think both EDT's have a slight alcoholic initial spray to them, they are very nice fresh fragrances once they dry down. At £8.50 a pop they aren't going to break the bank but they aren't exactly going to be the best perfume's you've ever tried. The packaging is basic but functional, and I wouldn't feel bad throwing it in a handbag for a night out. They last a fair few hours before needing to be reapplied which surprised me as I didn't expect it to last as long as it did. Another thing worth noting is that these scents compliment existing The Body Shop ranges as they also come in Body Butters, Body Sprays, Lip Balms, Soaps, Bath products and more. It's a nice way to keep a routine all smelling the same. In all, I think they are not the best and not the worst perfumes I've ever tried! I'll definitely be wearing both going into summer. It's also reminded me I really need to give the Body Shop a look around some time soon. I forgot how good everything smelt! I've also noted the Body Shop do a Coconut version, and as you may or may not know thats my all time favourite scent. Time to get down to my local Body Shop!